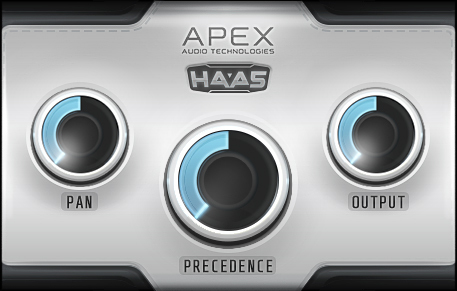 This plug-in uses stereo delays to create what is known as the “precedence effect”, also known as the “Haas effect” after Helmut Haas who’s 1949 Ph.D. thesis first described this psycho-acoustic phenomenon. The Haas effect creates a sense of direction by using the same system our own ears use to locate sounds in the natural world. By creating a slight delay between the left and right signals the listener perceives a sense of direction depending on which ear hears the signal first. So, if the right signal is delayed, then the left ear will pick up the sound first, causing the sound to seem to come from the left; and vice versa. Using the Haas effect, one can create a much more attuned and surgically precise stereo image. And, because the concept relies on psycho-acoustics the Haas effect lends itself to a much more natural panning effect than standard rotary potentiometer panning, which merely adjusts the volumes of the left and right signals separately to create an artificial and less real sense of direction. Copyright © 2015 Kane Audio. All rights reserved.